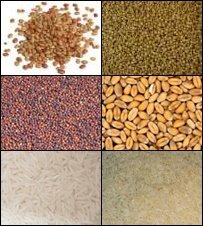 You will find here a list of grains, in English and three Indian languages Hindi, Marathi and Kannada. You will also find the list of flours made from different grains. Hope you will find this grain glossary useful. The whole grain names as well as the names by which the grain flours and commonly known names of split or broken grains are given here. We would like to make this a comprehensive list of grains. We are always adding more information about grains. If you find any ingredients missing, please use our contact form to inform us. Below you will find the list of flours made from different kinds of grains. These grains are used to make breads, snacks, sweets etc. Fruit Alphabetical List - Fruit list with English names. Alphabetical list of vegetables - Vegetables list. List of all vegetables - Vegetables list with Indian names.